Vietnam is best known for the Vietnam War, Pho, rice fields, and conical farmer’s hats. It is a beautiful country that has me absolutely charmed by its warm smiling people, and rich luxurious landscape. I have spent a total of one year living in a rural city in Central Vietnam. For my first trip, my sister Amber and I came together to volunteer at an orphanage. For our second trip, we came to volunteer again, and we ended up opening an English Center for children. Along the way, my sister married a wonderful Vietnamese man. I am currently in Vietnam for the third time, helping welcome my absolutely perfect nephew into the world. Vietnam and Canada have an endless amount of differences. The main one I’ve noticed is that while Canada is multicultural, Vietnam is almost entirely racially homogeneous So, how does that affect my sister and I while living in a rural city? There are always less than 10 foreigners living in the city long term (Some Asians, a few Cubans, an American, a Dutch lady, an Australian lady and my sister). Every single time my sister and I leave the house, we are greeted by smiling faces, warm touches, and so many questions about how Amber and the baby are doing. Naturally, as I am sure happens in every country in the world, people always want to give advice on what is best for the baby – at the market, the noodle shop, or just while we walk down the street, people offer their opinion. 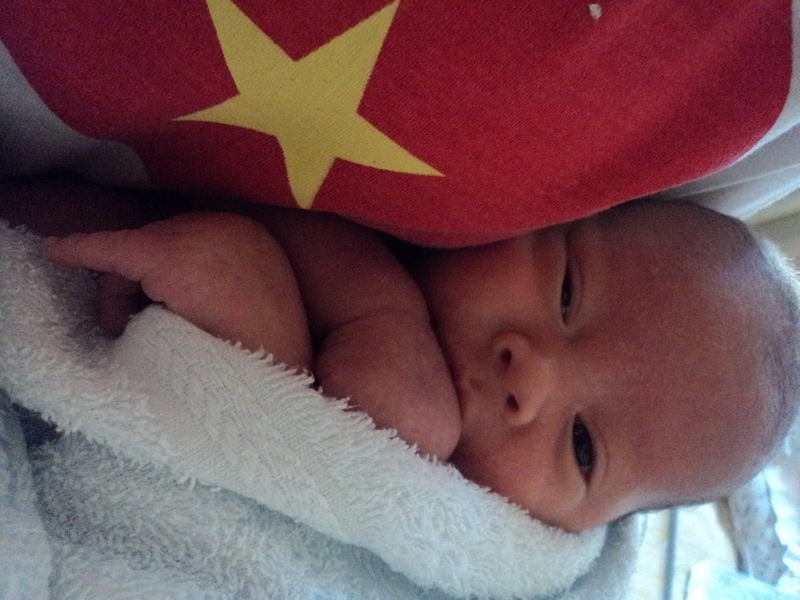 Amber was the first Westerner ever to give birth in our rural city, and along with the birth of my handsome nephew came an insane amount of Vietnamese traditions, all of which are so ingrained in the culture. I am certain that every single adult in Vietnam, regardless of religion or ethnicity, knows that it is tradition for women and their new babies to stay in their house for at least one month after the birth. During this time the new mother should also wear cotton balls in her ears, not touch or ingest cold water, and they generally have a little fire pit with herbs burning in the bedroom. These traditions seem a little odd, but they have clear purposes: the cotton balls in their ears are so no cold can get in to the women and bring them illness in their old age, same with the need to avoid cold water. The fire pit helps with post birth recovery and health. Vietnamese people have strict traditions that they follow for just about every single major, and most minor, life events. Festivals are also a big part of Vietnamese culture, and my favourite festival is the mid-autumn festival which is dedicated to children. It takes place over three days in the Fall, and boys form groups, going house to house to perform a dragon dance in exchange for money. Dragon dances are absurdly cool to see and the boys practice for months before the festival, which absolutely shows. The groups always put on an amazing performance, which is why the streets are absolutely packed with families checking everything out. It’s probably more popular than a Canadian Christmas parade and for my foreign eyes it is at least as exciting! I love that Vietnam’s traditions are so much a part of their culture. I think this is possible because they are a homogeneous country. It feels really comforting when every person who offers their opinion is saying a similar thing to the person before – straighten the baby’s legs when he eats so the milk goes all the way through his body, keep him warm, and so on. It is so much fun to be in a country that is unified in its beliefs and hear the same advice being told from every economic group, ethnicity, religion and age. This is in contrast to Canada where traditions are passed on within a family and each new family will create their own new traditions. This is really special and I love the cultural and traditional mosaic that is represented in Canada. Since Canada is multicultural, there is not one unifying message connecting us all but rather a collection of cultures, traditions and messages represented in one society. Both Canadian and Vietnamese cultures are beautiful and unique, and I love the opportunity to continue exploring and learning about each.